Whether your group is big or small, please call ahead to book in your races on (07) 3868 2225! PLEASE NOTE: This venue has a zero alcohol and drug policy, we reserve the right to refuse entry to anyone who we suspect is intoxicated. Please choose your karting carefully as there is no refunds for change of mind. All arrive and drive packages will incur a 10% surcharge on public holidays. All karts are fitted with state of the art safety systems. Please Note: For Cadet Karts (ages 7 & up), check out Slideways Go Karting World Pimpama (outdoors) or Slideways Go Karting Gold Coast Nerang (three storey indoors). Our fleet of two-seat dual karts can be found at Slideways Go Karting World Pimpama. Drivers under 18 years of age will require a parent/guardian to sign them in at check-in. 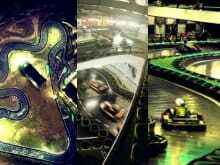 Do you love to race? Become a VIP and SAVE! For $150 you receive 6 x 10 minute races that can be used whenever you like! Use one now, save 5 for later, making it just $25 per race – our cheapest available karting! VIP Gold and Silver Passes are available 364 days a year, they are per person and not transferable, and can be used at any Slideways venue – they never expire! All two and three race packs must be used on the same day. Please note: VIP Gold and VIP Silver are not valid with Group Racing Packages. If you are looking to improve your driving skills, look no further than the Slideways Karting Academy! Our weekly sessions give newcomers to karting the necessary tools to race quickly and safely. Best of all, the one-on-one tuition provided by our highly experienced staff is free, you only pay for the on-track driving time at our massive traditional outdoor track – Slideways Go Karting World at Pimpama, only two minutes from Dreamworld. Don’t delay, check it out today! 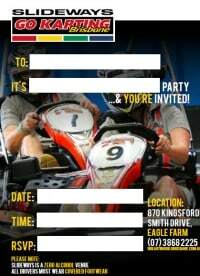 Click here to download our Slideways Go Karting Brisbane Party Invitation!